Need help getting organized? 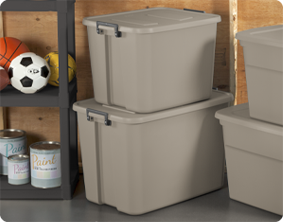 Step up to the 20 Gallon Latch Tote to solve a variety of basic household storage needs. Sort, store and conceal items in the garage, attic, basement, and closets. The color accent latches keep the lid secured to the base, yet are still easy to unlatch. This size Latch Tote is ideal for storing off season clothing, games, linens, boots, blankets and more. The contoured end panels and in molded handles provide a comfortable grip for lifting and carrying, making transporting the tote easier, whether moving into a dorm or storing away belongings in the attic or basement. The recessed lids allow same size totes to stack neatly on top of each other to use vertical storage space efficiently. The overall assembled dimensions for this item are 22 3/4" x 18 1/2" x 16 1/4". Overall Assembled Size: 22 3/4" x 18 1/2" x 16 1/4"
20 Gallon Latch Tote is rated 5.0 out of 5 by 2. Rated 5 out of 5 by HTH Farm from Love this style of Tote. We use ours for a different reason than most people. We store our feed grain in them. This style with the flip up, bar latch keeps most animals out of the bins. Some of ours have lasted 5 years exposed to all kinds of weather. As well as very determined sheep and goats trying to break into them. Oh, We also use them to put newborn baby goats in when it is too cold outside for them. Very Sad we have not been able to find more with this handle. The animals can open the other styles of handles without a problem. Rated 5 out of 5 by DEG1013 from Great product - latch handle provide sure closure/rapid access I found these totes a couple of years ago at a great price, so we bought a dozen. We use them to store a variety of items on shelves in the garage - everything from Christmas decorations to infrequently used pots and pans. My wife bought some chalk board paint, painted the center end panel and re-labels as contents change. My only problem with this tote is availability - I haven't seen them in any of the local stores since that initial purchase.